A long day going over to Hilo and back for work. Here’s the grey view coming into Waimea town from Hilo side. It’s been rainy, windy and cold lately and today was no exception. 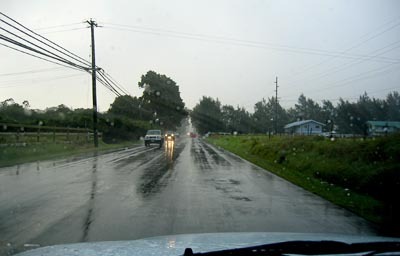 Hilo was nice, a little bit of rain while there but for the most part overcast. Farther along on my drive this time heading between Waimea and Waikoloa on the Mamalahoa Hwy. going towards Kona. Sunshine in sight with an outline of Mt. 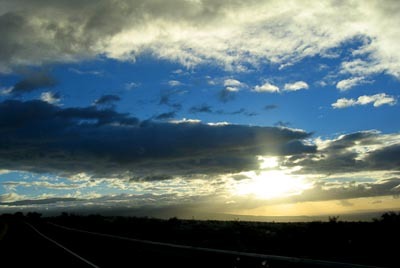 Hualalai on the left. A nice view after the mostly grey drive back.